Van der Zwaan is linked to former senior Trump campaign official, Robert Gates. 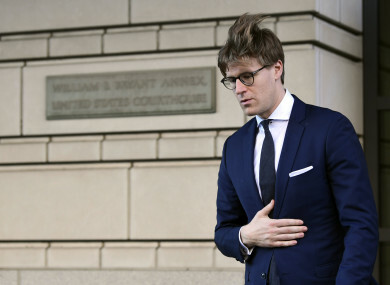 A lawyer linked to a former campaign aide of President Donald Trump pleaded guilty to lying to FBI agents Tuesday, as the probe into Russian election meddling gains pace. Special prosecutor Robert Mueller’s team of investigators accused Alex van der Zwaan of knowingly making false statements about his communications with Richard Gates, a former senior official on the Trump campaign who is under indictment on money laundering and tax-related charges linked to his work in Ukraine. Van der Zwaan, a London-based lawyer with the international law firm Skadden, was also accused of lying about his contacts with another unnamed person, the charges said. He will be sentenced 3 April, according to the Special Counsel’s Office. Little information was provided about Van der Zwaan’s links to the Trump campaign, but he represented his law firm in work done for the Ukraine government in 2012 on the corruption trial of former prime minister Yulia Tymoshenko. At that time, Gates and former Trump campaign chairman Paul Manafort were working for the Russian-backed Ukraine president Viktor Yanukovych, who himself was brought down in an anti-corruption uprising in 2014. Gates and Manafort, according to Ukraine government records, earned millions of dollars in their work for Yanukovych that was not reported. Manafort too has been indicted by Mueller on money laundering and tax-related charges. In a filing Friday, Mueller’s team said it had uncovered evidence of bank fraud by Manafort that was not covered in the original charges. Mueller, whose work focuses on whether the Trump campaign colluded with Russian interference in the 2016 presidential campaign, issued a surprise indictment Friday charging 13 Russians with alleged meddling in US politics. The special counsel is also examining whether Trump sought to obstruct his investigation. The White House has repeatedly rejected allegations of wrongdoing. Email “Lawyer linked to former Trump aide admits to lying to FBI in Russia probe”. Feedback on “Lawyer linked to former Trump aide admits to lying to FBI in Russia probe”.